New York: W. W. Norton & Co.
‘Do you not hear something?’; ‘I’m not aware of anything, what should I hear?’ So begins the portion headed ‘The Gift of Magic’ in this full colour facsimile of C. G. Jung’s The Red Book. Jung created this ‘book’ between 1914 and 1930, it being the end-result of a period of self-examination which he termed his ‘confrontation with the unconscious.’ This is the first appearance of what is claimed to be an integral part of the psychologist’s own oeuvre, and as such is regarded by many as the most important publication for psychology in the 21st century. 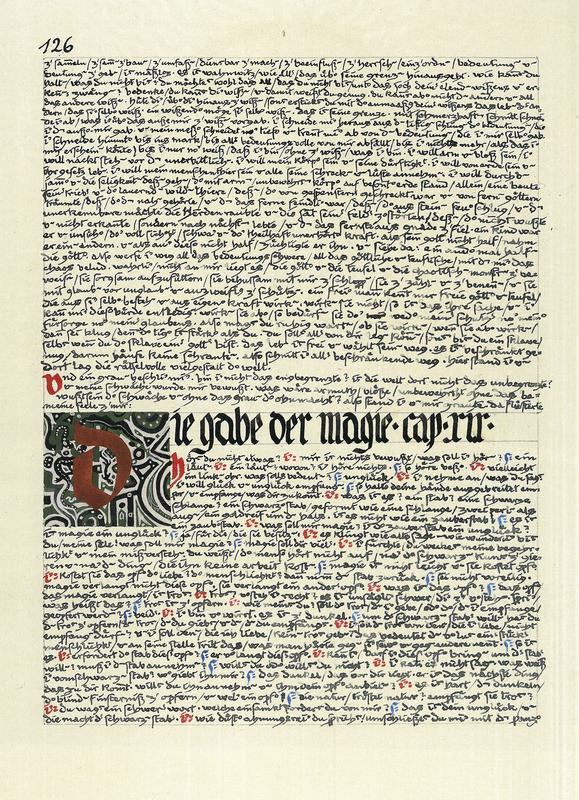 An English translation accompanies the text, which apart from documenting Jung’s own thought-processes, also reveals his abilities as a calligrapher and artist. This facsimile was donated to Special Collections. Carl Gustav Jung, “The Red Book = Liber Novus. First edition,” ourheritage.ac.nz | OUR Heritage, accessed April 22, 2019, http://otago.ourheritage.ac.nz/items/show/8308.